Electrical engineers, taking into account the principles and practices of engineering, develop and design electrical equipment. This includes equipment that's used in cars and aircraft; power generation; communication systems; motors; and radar and navigation systems. They also supervise the manufacturing of this equipment and perform tests to make sure it is functioning properly. Electrical engineers often use engineering and design software and equipment to do their work. They also sometimes work as part of cross-functionals team on large projects. An electrical engineer's salary can vary depending on location, experience, and employer. Beyond education and licensing, having some practical work experience, through an internship or similar program, can give job candidates an advantage. Education: To become an electrical engineer, you will have to earn a bachelor's degree in electrical engineering or electrical engineering technology from a program that is ABET accredited. ABET is a professional association that accredits associate, bachelor's, and master's degree programs in engineering, engineering technology, computing, and applied science. Only programs that meet the organizations' standards receive this designation. In addition to classroom study, you will also have to complete laboratory and field work. A number of engineering summer camps are available to K-12 students in the U.S. to help them jump-start their education. The camps are offered by various universities and research centers. The Engineering Education Service center offers a list of those engineering camps by state—and updates it on an ongoing basis. Licensing: Although you do not need a Professional Engineer (PE) license to work in an entry-level job, you may want to get this credential later on. It will allow you to provide services directly to the public as well as supervise other engineers. Exams: To become licensed, you will need work experience and passing grades on the Fundamentals of Engineering (FE) exam and the Professional Engineering (PE) exam. You can sit for the former test immediately after graduation and the latter one once you get experience. Communication: To communicate ideas to colleagues and clients, you need excellent speaking and writing skills. Superior listening skills will allow you to understand clients' needs and receive feedback from them and coworkers. Problem-solving: You must be able to identify problems and come up with possible solutions. Then you must use critical thinking skills to evaluating your options and choose the best one. Active learning: As an electrical engineer, you need the ability to acquire new information and incorporate it into your work. Analysis: You will have to be able to assess your own and others' performances, as well as that of electrical products, components, and applications, and make improvements as needed. 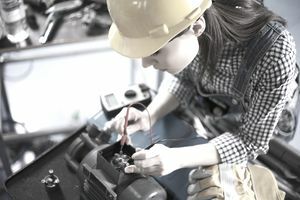 The U.S. Bureau of Labor Statistics predicts that employment of electrical engineers will grow 7 percent through 2026, which is the same as the growth average for all occupations in the U.S.
Electrical engineers generally work in an office but will also visit different types of sites to investigate problems or gather information for new tasks. Most electrical engineers work in the following industries: engineering services; electric power generation, transmission, and distribution; semiconductor and other electronic component manufacturing; and navigational, measuring, electromedical, and control instruments manufacturing. Jobs in electrical engineering are typically full-time. Exact hours will vary depending on the employer.